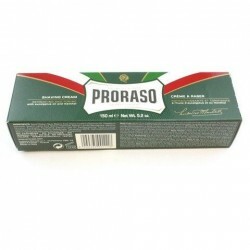 This shaving kit from Proraso is an ideal shaving gift. 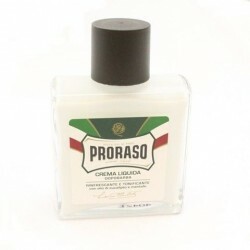 Presented in an attractive and sturdy tin case with vintage styling, it contains 3 full size products in Proraso's famous eucalyptus and menthol fragrance - a 100ml bottle of after shave balm, a 100ml jar of pre-shave cream and a 150ml tube of shaving cream. 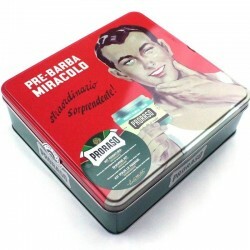 The tin is approximately 23cm by 23 cm and would be a useful storage tin for your shaving accessories long after you have used the products included with it. Prepare your skin for a perfect shave. Firstly massage the pre-shave cream onto dampened skin, then soften your stubble using the shave cream. Squeeze a pea sized amount onto the wet brush and create a thick lather in a mug or on your hand. Then work the lather in to your beard using circular movements before using your preferred razor for a perfect shave. 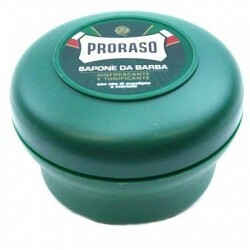 Relieve any razor burn and help soothe and moisturize the skin afterwards with the after shave balm.